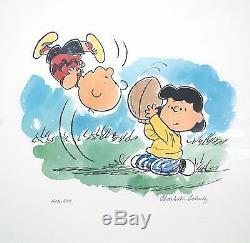 Original Peanuts Animation Art Limited Edition Lithograph, Auugghhhh.. 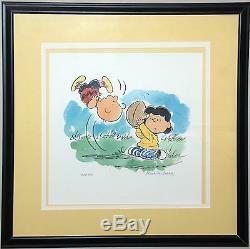 Studio: Peanuts Medium: Limited Edition Lithograph Title: Auugghhhh... " Signed: By Charles Schulz Characters: Charlie Brown and Lucy Edition: 404/500 Framed: 26" x 26 framed Year: 1994. A certificate of authenticity guaranteeing the authenticity of this artwork for life will be issued by Georgetown Frame Shoppe. This work of art was authenticated by Peter Bortz, gallery owner of Georgetown Frame Shoppe. Peter Bortz has been an animation art dealer since 1989. Aside from having the experience and expertise of being an international dealer for over 20 years, Peter Bortz has an extensive collection of catalogues raisonnes from which to reference and authenticate a work of art, as well as an in depth knowledge of the variety of production processes, media, and techniques which can additionally serve to identify a work as being genuine. Peter Bortz provided a verbal confirmation that this work of art is authentic. In business since 1989, our large collection of animation art includes art from Warner Brothers Studios, Walt Disney Studios, Hanna Barbera, MGM Studios, and 20th Century Fox as well a smaller studios. Some of the films we specialize in are. The Grinch Who Stole Christmas. To view some of our fabulous collection in person, please visit Georgetown Frame Shoppe at 2902 1/2 M Street NW in Georgetown, Washington, DC. 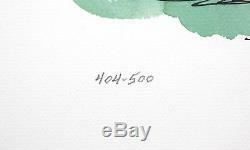 The frame may contain scratches, dents, scuffs, fading, and other imperfections. Animation Sensations can accept your offer, reject it, or make a counteroffer. The item "Peanuts Limited Edition Lithograph Auugghhhh. 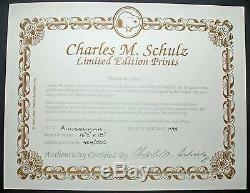 Signed by Schulz Charlie Brown" is in sale since Tuesday, March 28, 2017.